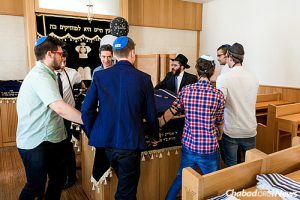 Earlier this month, five Phi Eta colony brothers attending the Lauder Business School in Vienna became Bar Mitzvahs. 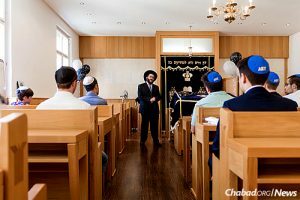 With help from Chabad on Campus and Rabbi Boruch Sabbach (co-director of the Jewish Heritage Center), Brothers Dima Solovei, Benjamin Pretzer, Peter Vandor, Yvegen Sholudchenko and Dani Markus studied over a seven-week period to prepare for the ceremony and were joined by their families from Switzerland, Germany, Hungary and Ukraine. Brother Master Peter Vandor (Vienna, 2018), who is originally from Hungary, expressed the importance of the event. 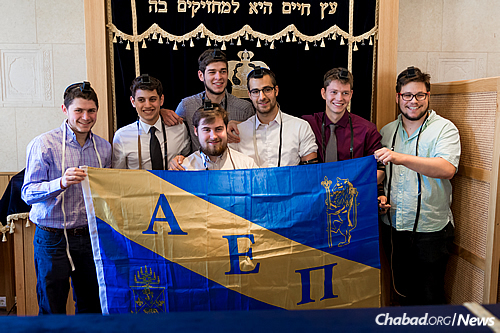 AEPi wishes a big Mazel Tov to the new Bar Mitzvahs! For more information regarding the Bar Mitzvah Initiative, email Director of Jewish Enrichment and Education Moshe Lencer. Courtesy of Chabad on Campus and Chabad Lubavitch News.